The devastating fire that ripped through Notre Dame cathedral has encouraged an outpouring of support from wealthy philanthropists, with billionaires among those pledging at least 400 million euros ($452 million) to rebuild the ravaged structure. But these large donations have been met with exasperation by the building's senior fundraising adviser, who is asking why it took such a tragic event to raise the money the building has desperately needed for years. "It's very, very frustrating," Michel Picaud told NBC News. "The importance of restoring this cathedral is only in the full light today, which is frustrating because part of it has been burned in the fire and has now disappeared." In 2014, France's Ministry of Culture said the works would require 150 million euros in funding (around $169 million). But until Monday raising the cash has proved difficult. Picaud lamented the paradoxical situation in which he now has more than double the amount of money he was originally asking for, but only after some of the features he wanted to repair have been destroyed. Although he said he was frustrated the money only came after the fire, he said he was "quite grateful" to those who had donated. "We absolutely need billionaires contributing to this because the work is now absolutely huge," he said. Because of the country's strict secular laws, Notre Dame is owned by the government, which allows the Archdiocese of Paris to use it for free. The government spends around 2 million euros every year on its upkeep, but the church says this is only enough for relatively minor repairs. "The government is in charge of 93 cathedrals all over France and the amount dedicated to Notre Dame de Paris was not enough for the restoration," Picaud said. Susan Corr, president of the European Confederation of Conservator-Restorers' Organisations, said this was a common fight for those trying safeguard even the most celebrated cultural sites. "Heritage sites come at the end of all government budgets," she said. "For people who work in the field, when it comes down to it, it's hard to get funding. The value of these sites is intrinsic in so many other ways." To try to make up this shortfall, a U.S.-based charity, Friends of Notre Dame, has stepped in over the past year or so, raising 3.2 million euros from private donors, according to Picaud, who is also the charity's president. The charity plans to raise 20 million euros over the next decade, added to 40 million euros pledged by the French government. Around 5.5 million euros of this pot was already being put to use, as could be seen by the scaffolding that surrounded part of the building during Monday's blaze. 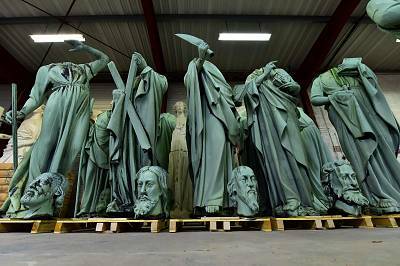 The project aimed to restore the spire and its 250 tons of lead, and days before the fire, the statues of 12 apostles and four evangelists were lifted by crane and taken to southern France for restoration. "The Arnault family and the LVMH Group, in solidarity with this national tragedy, joins the reconstruction efforts of this extraordinary cathedral, symbol of France, its heritage and its unity," according to a statement from LVMH, which is behind brands such as Louis Vuitton, Christian Dior and Moet & Chandon Champagne. Francois Henri Pinault, the head of Kering — which owns brands including Gucci and Yves Saint Laurent — vowed to donate 100 million euros ($113 million). "This tragedy is striking all the French people, and beyond that, all those attached to spiritual values," a statement from Pinault said. "Faced with this tragedy, everyone wishes to give life back to this jewel of our heritage as soon as possible." On Tuesday afternoon, French energy giant Total said it would contribute 100 million euros ($113 million) to an online campaign by charity Fondation du Patrimoine. The cathedral has bounced back before. 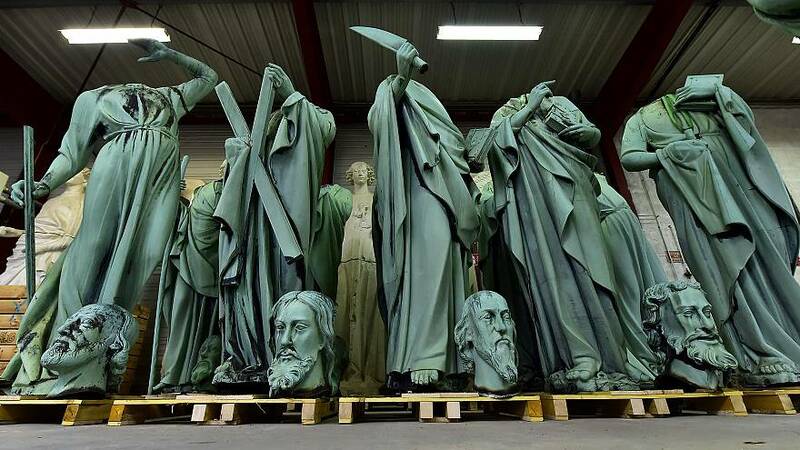 In 1831 Victor Hugo wrote in his novel, 'The Hunchback of Notre Dame," that "one cannot but regret, cannot but feel indignant at the innumerable degradations and mutilations inflicted on the venerable pile, both by the action of time and the hand of man." It was restored in the 1800s, including the construction of the spire that was destroyed Monday. Looking to the future, Picaud says he can only hope that the new surge of support will continue after the headlines die down.